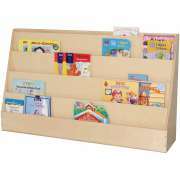 Preschool book displays are designed to attract the attention of young readers. 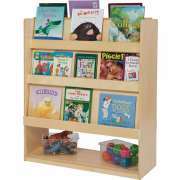 Unlike regular bookshelves, childrens bookcases make each cover clearly visible, so little ones can choose what they like. With enticing covers and familiar titles at eye-level, little ones will be excited to sit down and open a book. Where is the best place for books in a preschool classroom? 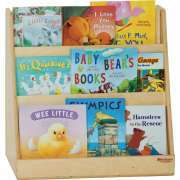 It&apos;s easy to keep your preschool classroom books or children&apos;s library organized and efficient with preschool book displays. A great design will transform any space into a positive learning environment. What kinds of book displays are there? Book displays come in different configurations to fit in various parts of the room. 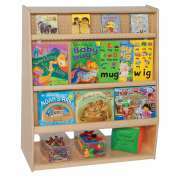 If you want to put a childrens bookcase against a wall, we have a wide variety of one-sided models to choose from. Alternatively, if you want to place some books in the middle of a room, you can get more display space by using a two-sided preschool bookshelf. Either of these options offers a great way of dividing up a classroom into preschool learning centers. 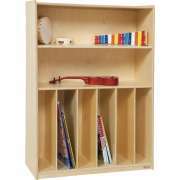 When you want to fill up lots of open space, there are a number of large childrens bookcases in fun shapes. Creative configurations from the Gressco Modula System provide tons of fun spaces for your books and reading accessories. Choose from a house shape, train shape or other fun options. 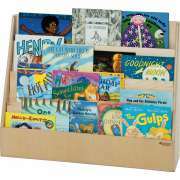 Little ones will just love peeking into these cool book displays to see what&apos;s in every compartment. The unique arrangement of multiple compartments enables you to put books together with related accessories such as stuffed animals and sensory activities. You can also divide up the compartments by theme, author or level of difficulty. 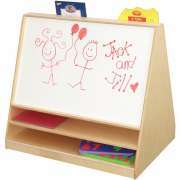 This is a great choice for a classic preschool or daycare setup or even a montessori classroom. How can I get preschoolers excited about reading? To get preschoolers excited about reading, you need to show them how much fun books can be. 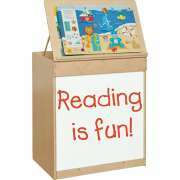 Clear book displays from Children&apos;s Factory make covers highly visible so little ones can easily identify titles that they wish to explore. Clear pockets keep books firmly in place so they won&apos;t slide off, and are easy to put away. 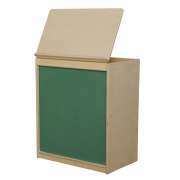 This practical design is available in both toddler- and preschool-size children&apos;s bookcases to ensure that young learners can easily reach every book from a safe and comfortable position. 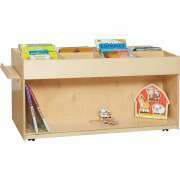 How can I coordinate my bookshelves with other preschool furniture? Whether you are looking for a great place to keep your books in a classroom, children&apos;s library or anywhere else, it is always nice if you can coordinate your children&apos;s bookcases with other furniture in the room. 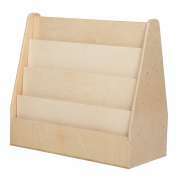 We have many book display stands that feature a natural wood finish which will look great almost anywhere. If you want to add some color to your classroom, we also have Educational Edge bookcases which feature brightly-colored accents. You can choose to coordinate these colors with other classroom furniture, or use this opportunity to add a new hue to the decor. While many book display shelves are stationary, there are also mobile options. 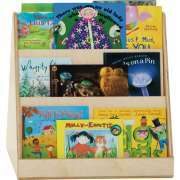 Stationary childrens bookcases are the logical choice if you want to keep your books in one place for long periods of time. 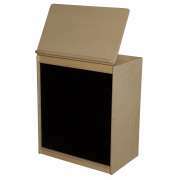 Book displays on wheels are easy to transport and are especially helpful if you frequently need to move furniture around or clear your room so it can be used for other purposes. 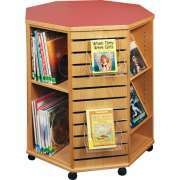 In addition to a great selection of book displays, we also have children&apos;s bookcases that are part of reading terraces. 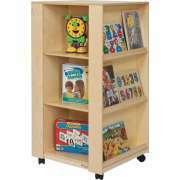 These convenient units provide terraced seating where little ones can sit and read independently or listen to a book that is being read by a caregiver or librarian. 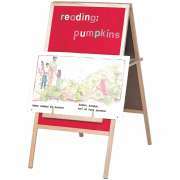 They are designed to enable all of the children in the class to view a book easily without having to strain or push. 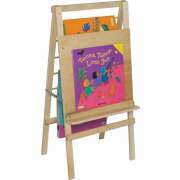 Another great thing to think about getting for the classroom, especially if you have a preschool learning center that is focused on books or a designated reading corner is a big book easel. 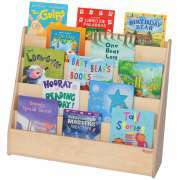 A big book stand is a great place to feature a particular book the class is learning or read aloud with a big group of children. 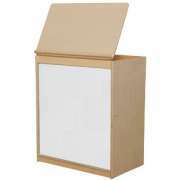 Some of our big book easels even come with extra storage space for books that are not currently on display. Hertz Furniture&apos;s collection of book displays and children&apos;s bookcases has everything you need to make your classroom or library accessible to young learners. When appropriate books are readily-available, placed at eye-level, children are able to appreciate reading from a very young age. If you need help deciding on the ideal arrangement or choices for the space you have, contact the experts on the Hertz Project Solutions team.